A young and growing SCJ entity | Walk with us! ← Rushing to catch a train… Indian style! As noted previously, Fr. Tom Cassidy is assisting with the formation program in the District of India. 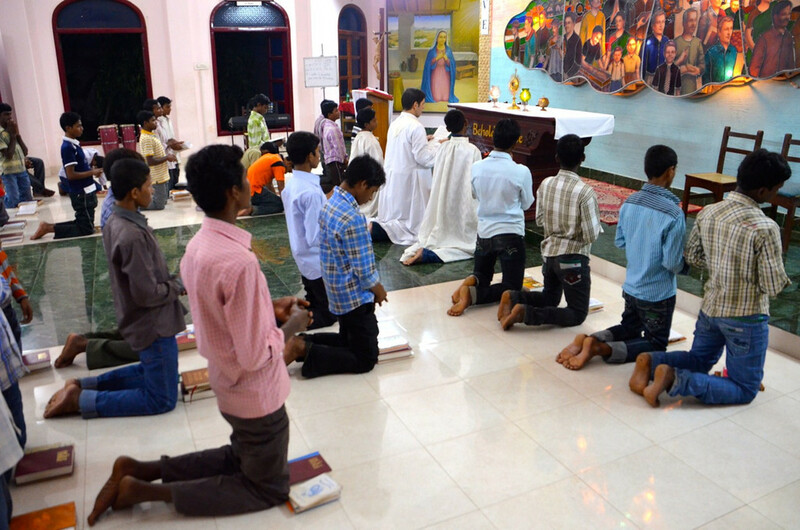 Today he writes about the some of the SCJs in the district, noting that youth is both a blessing and a challenge for the congregation’s presence in India. Yesterday Fr. Gopu Bala Joseph Reddy, SCJ (Gopu) moved to Eluru as he will assume the duties of treasurer for the community on April 1, 2014. He will replace Fr. Jojoppa, SCJ, who will then be able to devote full time to his duties as pastor. I believe Fr. Gopu, SCJ, will split his time between the theologate and assisting in the parish. Fr. Gopu, SCJ, did not arrive alone; he came in a novitiate vehicle along with some of the novices and Fr. Gangarapu Marianand, SCJ. He and Fr. Gopu, SCJ were ordained earlier this month. Finally Fr. Ajit Kumar Basla, SCJ, accompanied the group. Fr. Ajit is from north India where at the moment the SCJs are present only in Mumbai. Indians tend to think of their country in terms of north and south with Andhra Pradesh being the boarder state, i.e., anything north of here is in the north and Andhra and any state south of here is southern India. I am not sure what assignment Fr. Gangarapu, SCJ, has received, but in addition to Fr. Gopu, SCJ, being assigned here he will be joined by Fr. 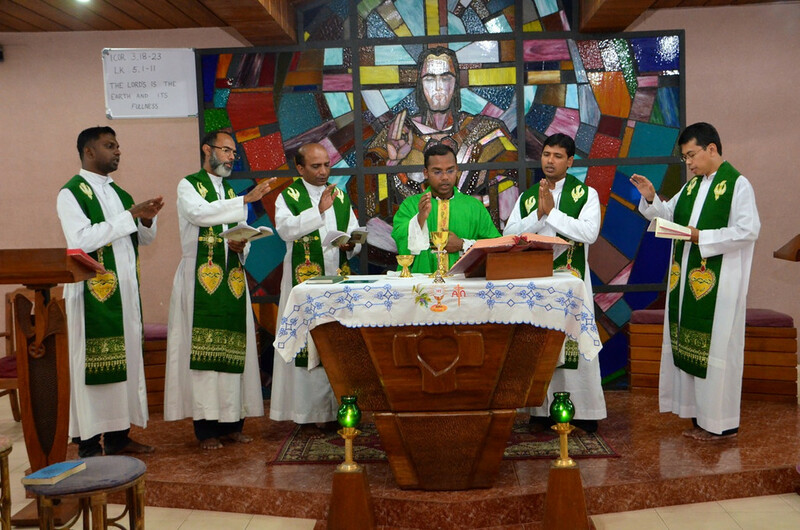 Siju Saloman, SCJ, who was ordained on March 1st in Kerala. I met Fr. Siju at Kumbalanghy where he served on the formation staff as a deacon while also assisting in a local parish. Now that the number of theologians will increase (they will double next year!) and with the postulant program moving elsewhere, having at least two full time formation staff is important. The fact that both Frs. Gopu and Siju are so young underscores the reality of both the challenge and the blessing of our young district. 2014 marks the 20tht anniversary since our arrival in India. Starting from scratch is never easy and it was even more difficult here since the Indian government does not permit foreign missionaries to work. With the help of some benevolent bishops and lay people, and the efforts of many SCJs from around the congregation, we were able to plant the SCJ charism first in Kerala and now in several other states including Andhra Pradesh as well as the metropolis of Mumbai. The challenge for the district is that they are so young and lack the experience that comes with age. Fr. Thomas Vinod, SCJ, is the first Indian District Superior and he will turn 35 this coming December. His age may be the average age of the district. It also might also be lower as the nine novices will make their first profession on May 1, 2014, and the nine postulants who were here will begin their novitiate year. The first US Provincial Fr. Richard Keefer, SCJ, is often quoted as saying: “You build with the bricks you got.” That certainly was true in the early years of the US Province and is most certainly true here! Here in India many men are involved in formation programs to ensure a future for the community. The district also staffs three parishes. I have spoken of all three: Mumbai, Nambur and here at Eluru. Again the pastors are all very young SCJs. Fr. Dharma, for example, at Nambur was tasked with building his parish church, which was dedicated in January. He will turn 31 in September. Fr. Jojappa turns 34 in June and he will relinquish his duties as treasurer here so that he can devote all his time to time to the parish, including the challenge of finding the money for the land and construction of a parish rectory. Fr. Benzigar Aji, SCJ (Mumbai), will turn 40 in October and was among the first to join the SCJs. Actually the genesis of my coming to India was a request made by Fr. Thomas Vinod at our last General Conference held in Neustadt, Germany. Fr. Thomas asked provinces to consider sending older SCJs to spend time with their Indian SCJ brothers since they are so young and don’t have the historical perspective that older SCJs represent. While I have spent most of my time living with the theologians and postulants, by the time I complete my stay here I will have visited most of the houses of formation. I will miss the philosophy house in Aluva though I am familiar with it as it was the first stop on my trip in 2011.